Featured Did The Bible Or The Papacy Transfer The Sabbath Rest To Sunday? Discussion in 'Christian Debate Forum' started by Phoneman777, Dec 8, 2018. Our papal apologist friend Bread Of Life has insisted that the papacy finds Biblical support for it having "changed" the Biblical Sabbath from the 7th day of the week to the 1st day of the week. Question: Have you any other way of proving the Church has power to institute festivals of precept (change the Sabbath)? 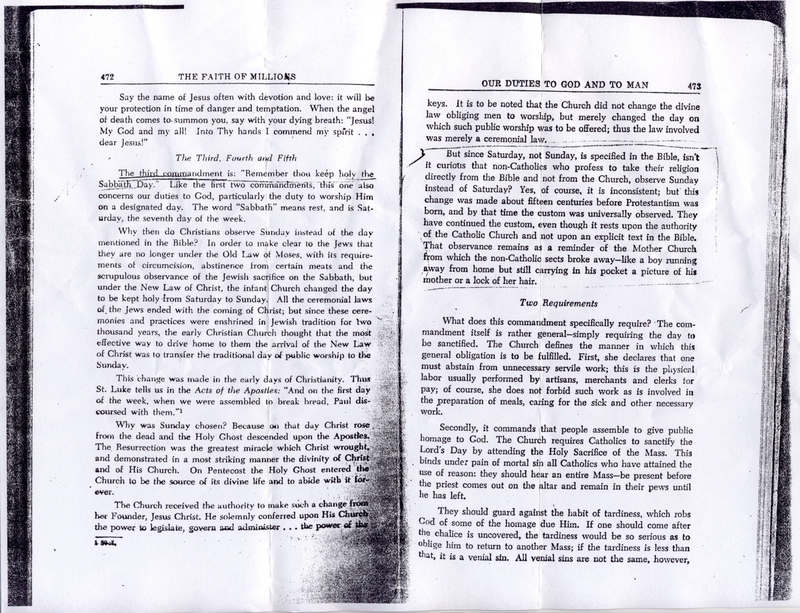 Further statements offering indisputable clarity on this issue make absolutely clear to us what the official papal position is, which should leave no question as to what that is, and any papist - the presence of which should immediately cause suspicion - who enters CB and attempts to teach otherwise should stand exposed as a fraud (or a Jesuit, the order of whom swears that deceit is not only acceptable, but commendable, in the advancement in the cause of the papacy, which is the destruction of Protestantism). If the papacy believes all these statements are heretical, why weren't any of these men burned at the stake or beheaded - as was the fate of so many "heretic" Protestants? Actually, the very early Christians moved it to Sunday because they shared synagogues with Jews. But the Jews used them on Saturday so they were not available to them. I believe that Heb. 4 shows us that every day is now the Sabbath as we rest in Christ's finished work on a daily basis. The "Sabbath" was a type for the reality. Taken, Waiting on him, Episkopos and 1 other person like this. A daily basis and even moment by moment. Amen! We need never speak our own words or do our own deeds again. Well for once our papal apologist is correct. The first day of the week became the Christian sabbath while the apostles were alive, also called the Lord's Day in Revelation. Waiting on him likes this. We pick one or more days as our personal Sabbath. There is no collective Sabbath. No collective holy days. And the reason was simple. The Christians met in synagogues. But the Jews use the synagogues on Saturday for Judaism. The early Christians wore the symbol of the fish, meaning fisher of men, to identify themselves to other Christians. Not as something holy or sacred. I read somewhere that the church met on the first day...saturday evening with the Jewish believers. Then, the next morning the church would come back together in order to break bread. So there were 2 meetings. Over time, the saturday meeting was eliminated in favour of just the sunday morning meeting. So what was eliminated were the deeper things...spiritual gifts, deeper teachings...the mature stuff. These were a part of the evening meeting. Since the apostle Paul was trying to eliminate this type of thinking, how credible is this story? Looking at the thread title again Catholicism did not move they worship to Sunday. Why? Because it didn't exist then. The early Christians moved NOTHING. Yes, there is historical evidence that some Christians kept Sunday along with Sabbath in many places (as a memorial to the resurrection; because of political expediency, etc. but such was based on man's choice, NOT God's Word), but Sabbath keeping was eventually outlawed in every place that the evil papacy established dominion - because the Sabbath points to the Creator but the papacy prefers Sunday which points to the Sun god - Satan. Hebrews 4:9 plainly says that if a believer is resting in Christ, that believer will demonstrate that inward rest by resting outwardly from his work just as God rested from His work: on the Sabbath. That verse is speaking of the eternal rest we have to look forward to. You are speaking to a seventh day adventist who is defending his religion at any cost, as someone put it. Nothing to do with what Christ has required of us. Then why is "rest" and "ceased from his own works" in the present perfect tense in both cases -- and not future as you suggest? Case one: "...he that has entered..."
Case two: "...he has ceased..."
It is a common belief that the RCC changed the worship service from the seventh-day worship to the first day of the week. THAT IS NOT TRUE! God Himself changed the date. It cannot be seen in the English Bible translations and why God allowed the miss-translation is beyond me. Perhaps to foster unbelief? This first half of Matthew 28:1 is what we’ll focus upon. The word Sabbath in Greek is the plural word “sabaton” and note the word “week” is also the identical plural Greek word “sabaton.” The word “week” is singular and contrary to the plural Greek word: sabaton.” This is proven by checking the Greek. Anytime we see an italicized word in the KJV, as in the word “day” the translators are warning the reader that that word is NOT in the original manuscripts. Note: even in death God rested on the Seventh Day Sabbath as He lay in the tomb, which BTW, was a Saturday day (a day of rest)! Let us now put together the first half of Matthew 28:1 and see how it should read: “In the end of the Sabbaths, as it began to dawn toward the first of the Sabbaths...” (underlined words for emphasis). We see now the first part of the passage makes sense. The nature of the Seventh Day Sabbath was not to do any kind of work. By contrast, the Sunday Sabbath is to do work. "Spiritual work" that is. As God declared in Isaiah 58:13-14! The work we are to do is: study the Bible, write letters to love ones about the Gospel, visit hospitals or prisons to share Gospel, attend service at church, give our tithes, and so forth. Some Christians go to ball games, picnics, movies, or play sports on Sundays after worship, and these activities are against Isaiah 58:13-14. There are aspects of salvation that can be seen in both the Saturday and Sunday Sabbaths of the Lord. I hope and pray this will be realized in this thread. The above Scriptures are self-explanatory as explained in the first page. Already, the apostles began to observe the worship service on the first day of the week! Today the worship service has not changed, and the breaking of bread (communion), and the preaching of the Gospel, and bringing in our tithes are still prevalent. I hope and pray the contents of this OP is understood. That's not a future object - it's a present state of mind Paul is exhorting us to obtain/retain.